My friends...it feels like it's been an age since we've all gathered to discuss books...like, it's been longer than usual. But here we are, on Show Us Your Books day! Something new this month: In parentheses at the end you will see where/how I read the book. I just want to keep track and I'm doing it here. And one more thing before we start - Dani from Faster than Forever and Erin from Texerin-in-Sydneyland are challenging themselves and everyone else to read their books...like all the books you own that you haven't gotten around to reading yet. 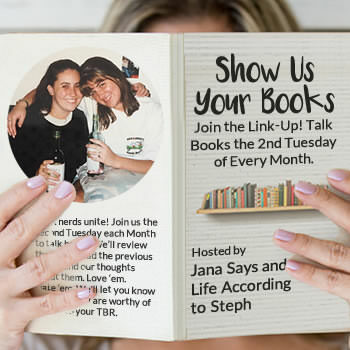 They're doing that in June and linking up on Thursday, July 14, so if you link up here you'd have Show Us Your Books on July 12 and that on July 14 and there you go, you pretty much have two posts that write themselves that week. Plenty of time to go through your books and get a pile going. The next one is Tuesday, May 10, 2016. Here's what I read since the last linkup. 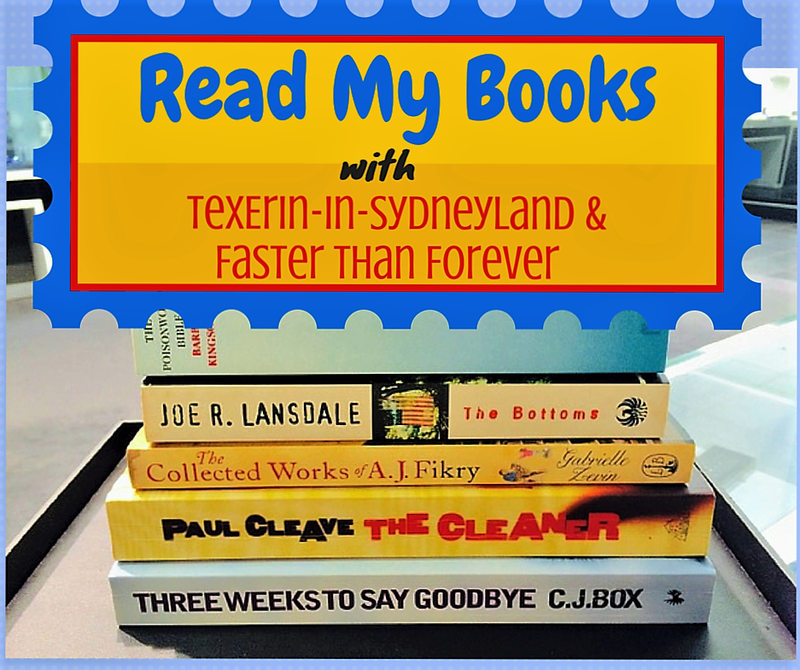 As an example of how I don't really count books...when I sat down to write this post, I was sure that I had only read four books since the last linkup. First, you know you're a booknerd when you sit and stare at the timestamp in the corner of the laptop for it to roll over in time to add your link to the SUYB link-up. I'm guilty! Second, thank you mucho for the challenge shout-out! Third, I was wondering if it seemed longer than usual. I seemed to read a few more books than normal. Fourth - hooray for a month of no "hard no" books. Fifth - there are a couple of books that I added with gusto! Water from My heart is going on my list! If it gutted you then it is a must reads in my opinion! I didn't realize how many books I read until I wrote my post too. A good problem, although I need a better system because I'm getting old and forgetful. :) I agree WW2 books can be difficult but important reads. Lilac Girls is making the list but I'll have to be mentally prepared for the story. The Silent Sister was already on my list and I'm bummed to hear that you thought it was only passable. yay for no hard no books! water from my heart sounds good, added it to my list. i have lilac girls on my kindle so i am glad you liked it! i'm gonna wait until i am in the right mood for it though. Wooohoo for not having any hard no books this month! Definitely gonna check out your top reads! Awesome! Adding more to my to be read list. Also. I'm in love with listening to The Armchair Librarians. I can't wait for the next episode to post. Adding Water From My Heart and Lilac Girls to the TBR! Yay for no DNF! I saw someone reading Lilac Girls on the bus the other day and I thought the cover was beautiful so I checked it out on Goodreads. I think I'll add it to my list to read sometime later this year...I have already read a lot of WWII books this year and I am feeling burnt out with them a bit. Water from my Heart sounds so good...I am adding that to my list! How exciting to have a month with no hard no's! I'm interested in All The Missing Girls, I like books that leave you wondering WTF they are some of my favorites. Finishing my IRL TBR is one of my yearly goals. Not sure I could do them all before then, but nice to see I'm not the only one with that problem! Haha. Yay for a good reading month- no "No's" is always a good thing! I feel like since we talk about books every week I have very little to say BUT...I did see The Lilac Girls on some best of list. I probably won't read it because I cannot handle historical fiction, especially ones revolving around the Holocaust, but maybe. You never know. I have Before the Fall in my NetGalley backlog. I should probably get to it. I feel like you girls talk about books quite a lot! It's a good thing. My heart can't take certain topics. The Lilac Girls!! I will file this for the day I decide I want to read fiction! Your reviews are spot on. Stay dry. #aprilshowersbringMayflowers. Love. Your. Momma. I have Lilac Girls from NetGalley and you've made me so excited to read it! WWII books are never easy to read, but like you said you have to continue telling the story so people remember. I just started reading The Nightingale this week, and I'm definitely preparing myself for a great story but a difficult one to read as well. I added Water From My Soul on Goodreads! It sounds like such a good book, and that's awesome that it got 5 stars from you as well! If it's your favorite book of the year so far, then I have to check out Water From My Heart. I still haven't gotten the hang of NetGalley and forgot my password, so I should get into that. If it can get Steph, lover of paper, to read an ebook, then I must really be missing out! It is always nice to have a great month of books with now BLAHs. Gonna grab the WW2 book since we'll be over there soon. I added all three engrossing reads to my Goodreads. They all sound good. I'm on board with Lilac Girls. As I mentioned before, I love historical novels focusing on women. They are fascinating and I enjoy the different time and setting. I am actually listening to your latest podcast right now :) I have been loving catching up on them. reading all the harry potter books is really making me want to switch it up! added all the engrossing reads to Goodreads! I'm also listening to some non fiction about the Lufthansa heist and it's awesome!! As always you rocked it! I really need to start listening to your podcast - so exciting! I do love a good redemption story as well! Going to try Water From My Heart. I have Opening Belle on my TBR list but my library doesn't have so not sure it's worth buying now. I think it's in the "if I don't have anything else to read" category, which basically means never... We'll see. I've decided that for the rest of 2016 I'm not reading any WWII stories. I read both Winter Garden and Salt to the Sea and both just completely messed me up. I'm emotionally exhausted and disgusted with people! I hate the star system as well on Goodreads! When are we going to get half-stars?! I've added Water From my Heart to my to-read list. I'm adding all of your Engrossing Reads to my list! Actually, I didn't know you and Jana had such strong feelings against the rating system until I listened to the podcast. I get where you're coming from. Yay there were no "hard nos" this month! That's awesome that you didn't have any hard nos! I listened to the first podcast episode yesterday - so fun to hear your voices (although I have already met Jana). Thanks for the shout out!!! All The Missing Girls is already on my TBR list. I have yet to read a Diane Chamberlain novel but keep hearing positive reviews, and this one sounds like a good place to start. Also, I just wanted to say that I (finally) started listening to your podcast last night and I LOVE IT, particularly all the tangents you guys go on. It really made me miss my old book club because that's exactly how we were! I've only listened to the first 2 so far, but I'll definitely be listening to the rest shortly. You may have turned me into a podcast listener/lover after all! I have had Lilac Girls in the pipeline for a while and I will definitely pick up Water From My Heart- I hadn't heard of it yet! I was so hoping to like Before the Fall more than I did, but definitely too much going on-- I think sometimes I prefer more development from fewer characters/storylines. Yay for no hard nos! 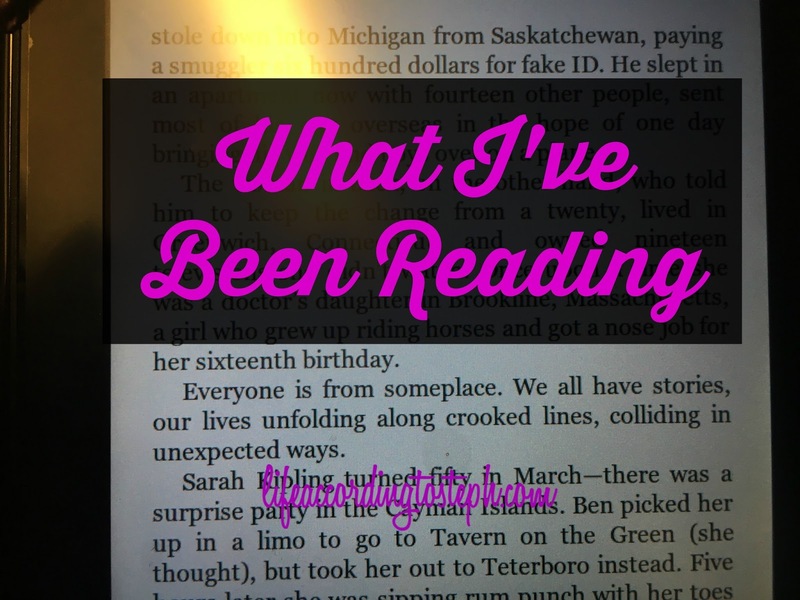 I added all your engrossing reads to my list. I'm such a sucker for WWII/Holocaust books. Awesome you had no 'hard nos'!!! That's great! And wow, so many books. Go, go, you! I added Water from My Heart and Lilac Girls to my to read list. I already had All the Missing Girls on my list! Opening Belle is sitting on my night stand waiting to be read. The Silent Sister was kind of weird but I enjoyed it. Glad you didn't have any hard nos this month! I'm not sure I could stomach a WW2 concentration camp novel. I can only imagine how powerful and heartbreaking that book was. Zero books in the hard no category, nice! I need to add a few of these to my list! I'm currently reading a few art, DIY, and writing books. I have a love/hate relationship with Goodreads ratings. Sometimes I feel like a book is worthy of an extra half star, but I usually just end up rounding up since there's no real option to say "3.5" (unless I actually write it in). I do like the ratings system for the most part, though, because it's a quick and easy way to record my immediate thoughts/feelings on a book without really thinking about it too much. I had to laugh when you said you thought you'd only read 4 books since the last link-up because, well, that's a LOT more than 4 books! Haha. I'm adding the first three to my list, as well as Before the Fall. For some reason I thought I already had Before the Fall and All the Missing Girls listed, but I didn't. Maybe I saw them on Goodreads and forgot to add them at the time or something. Regardless, I'm glad your post reminded me to add them now! My Heart and Other Black Holes has been on my list for a while, so I'm glad to see it was pretty good. All The Missing Girls sounds interesting! Putting that on my to-read list! Interesting selections. I have added Water from My Heart to my TBR. Have a good one! Great reads from NetGalley! I'm adding Water from My Heart to my list! You read more than me! The only one I've read of these is Silent Sister. I know I liked it, but I can't remember any of the story right now. Maybe that should tell me something. This makes me happy because I get THREE new books that weren't on my to-read list. Also, I'm always happy when people have a round up without books they didn't like. Adding All The Missing Girls and Water from my Heart, both sound really good. I am looking forward to the summer since my reading has been slacking lately, and beach days are the best for reading. I felt like it had been longer than usual since linking up too. I haven't heard of any of these books, but off to goodreads to look them up! Lilac Girls definitely sounds like a must read. I'm always drawn to anything WW2. I love the way you group these! It makes it so much easier to decide on what to read next! I actually have never heard of any of these titles, so I have some Goodreads searching to do! Always great to have no "Hard Nos" to report. Sounds like it was a bit of an emotional month of reading but these sound interesting, especially the "If I Had Known..." one! I think I have the If I Knew on my tbr already...but Lilac Girls is definitely going on my list. I love WWII period books both fiction and non. Water from my Heart looks interesting too. Most of these are books I haven't heard of, which is great because I love hearing about books i haven't heard of. I also am not a huge fan of the goodreads rating system. It honestly floors me they have not yet updated it to include 1/2 stars. step it up goodreads! I read The Silent Sister last year and I have to say the main character bugged me a bit as well. And I'm bummed about Opening Belle, I have it on my to read list. Lilac Girls just got added to my list. I love those kinds of reads. I would try Lilac Girls but I feel like I'm over WWII at this point. I've read so much of that in the last few years. Maybe All the Missing Girls? I love unreliable narrators. Thanks for giving me a place to talk about books!